An ultrasound machine generates ultrasound waves. The machine is connected to a small probe that is held gently against your pet's skin. 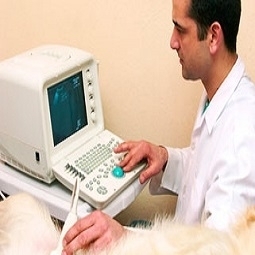 The probe sends out painless ultrasound waves that bounce off of structures (for example, organs) in your pet's body and return to a sensor inside the ultrasound machine. The ultrasound equipment collects these reflected "echoes" and uses them to generate images that are viewable on a screen. Ultrasound waves can generate excellent images of abdominal organs, including the liver, spleen, gallbladder, and kidneys. It is also useful for assessing fetal health and monitoring pregnancy in breeding animals, and it can help us diagnose and stage (determine the severity of) some forms of cancer.